Working in the Superyacht industry. 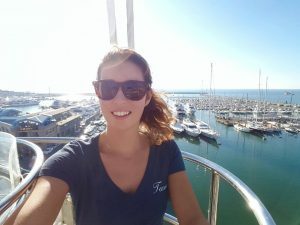 We caught up with ex-student Charlotte Fox who had an interesting start to her life in the Superyacht Industry. Charlotte, who was new to yachting industry spent two weeks training with Flying Fish in March 2017, we were keen to see how she got on! What made you join the Super yacht Industry? I decided to join the yachting industry as someone I knew was about to go looking for work as a Deckhand and they mentioned that there must be nannying opportunities aboard yachts. Very exciting prospect so I decided to qualify as a Stewardess with an STCW to be more employable. What were you doing before you did your training? Before I did my training with Flying Fish in Cowes I was working as a private qualified nanny in London. A week after the course, I flew to Antibes with 6 other girls from the 2 week course, we all share a house which was great fun. Day 1, most of us go dock walking, I don’t. Instead I go to the Blue Lady Pub to do some work and to leave my CV and business card. Day 2, I receive a phone call from a captain asking to meet up with me as his Chef found my CV and business card on a night out! The Captain and I meet 5 minutes later in a cafe, have an interview over a coffee, and he tells me he will call me later to arrange a time for me to meet the crew and boat. He calls, he has a quick phone interview with my friend as I handed him her CV at the time since he was looking for a deckhand – he invites us both over to see the boat! Day 3, we both end up working most of the day and talking to the crew, the captain eventually offers us both a position onboard a 32m Classic M/Y! How long have you been aboard your current yacht? The first yacht I was on was for a Mediterranean season for a duration of 3 months. The second yacht was for a shipyard period in Italy and an Atlantic crossing to the Caribbean on a S/Y which lasted a total of 3 months. I love working on yachts as I get to see the most beautiful clear waters, stunning sunrise/sunsets and I work with an awesome crew! Every yacht has incredible opportunities – on my first yacht i got to swim in the med nearly everyday when the guests weren’t onboard of course! On my second yacht I got to jump off the cap rail with the rest of the crew in the middle of the Atlantic ocean! However the best part of joining this industry for me has been able to work as part of the same crew as my best friend. How does working aboard a yacht affect your family life? Being away from home for a long time can sometimes get the better of you, especially when starting out, but the benefits definitely outweigh the harder times! On my first boat, I sadly wasn’t home when my grandmother suddenly passed away. The wifi and network was very poor and I couldn’t really contact home much when I needed it the most. But looking back, I don’t remember that event as the overriding experience, instead, I immediately think of the times I went swimming and sunbathing with my friend while the guests were ashore or when I went paddle boarding with the owner’s children. So many good times to remember that the rest seems so far away. What is the most bizarre request you have had since working on Super yachts? Luckily I haven’t had bizarre requests! I have worked for some lovely guests aboard my 1st yacht and during the second we had none! Although, one time I was asked if I could sleep in the same room as a 6 year old who came aboard as a one night only thing… barring in mind he didn’t know me, he also could have easily shared a room with all the other kids aboard or with his own parents that stayed the night in a separate room! Nannying requests are often out there but I never had that one before! What advice would you give to others looking to get into the Superyacht industry? If your looking to get into the super yacht industry I’d say go for it! Yes it’s tough to start off with and yes money is spent before it’s made again, but nobody said anything great was achieved easily and stress free. There will always be good and bad times, but in this industry you will experience things that you can never have anywhere else! You have to stay open to new experiences, be determined to achieve what you set your mind to and above all be positive. I wanted to join the industry to carry on being a nanny. Turns out I was hired as a Stewardess with occasional nannying on the side. I then went on to be a sole Stewardess on my next yacht, no nannying insight however, I ended up doing a lot of Deckhand duties that were not planned! Here I am a year later, at home, working toward sea qualifications and going to the gym 5 times or more a week so that later this season I can find work as a Deckhand. My advice is to keep an open mind and don’t plan as things change fast! Be happy to go with the flow. Yachting offers unforeseen experiences and opportunities! What’s your best moment since joining the industry? The most memorable time since joining the industry has to be when we reached the Caribbean and my friend and I worked twice as hard for a few days while in Antigua so we could have the afternoon off to explore. We decided to go to a place called stingray city – We swam with Wild Stingrays!!! (no barriers/enclosures absolutely free). It was incredible!